I've been wearing contact lenses since I was 13 years old. Back in those days they only had hard contact lenses - no soft lenses, disposable lenses, solar powered lenses, gilt-edged, or anything else they have today - so hard contact lenses were what I got. And what I still wear today. And hard contact lenses were great for me. I saw better, I looked better, and I could much better identify the bullies beating me up in seventh grade. Life with contacts was and is good. Except when you drop one. The logical thought for finding a dropped contact lens would be to look where you dropped it, but contact lenses are anything but logical. Their secondary calling, beyond providing visual amelioration, is to confound and amaze. To that end, you have as much chance of finding a dropped contact lens anywhere near the spot where you drop it as you have of finding news on CNN. I was taking my contacts out in the bedroom one night about a week ago when one flicked off my long (!) eyelash, ricocheted off the bureau (I could hear it) and took off for points unknown. So, I got down on my knees and began searching through the carpet where I was standing. I got a flashlight and widened the search throughout the room. Parsing carefully through virtually each one of the carpet fibers, I found pennies, dead bugs, and enough dust to give a can of Pledge nightmares. I patted down my clothing to see if it had alighted upon my person as sometimes does happen. I patted down my clothing so thoroughly I became aroused. Still No Little Lens Lost. I next widened the search almost throughout the entire house. For the lens to have been in some of the areas of the house I was searching, it would have had to ricochet into a cannon about to be fired. So, I called the eye doctor's office to have a new lens made. "Hi, this is Perry Block. 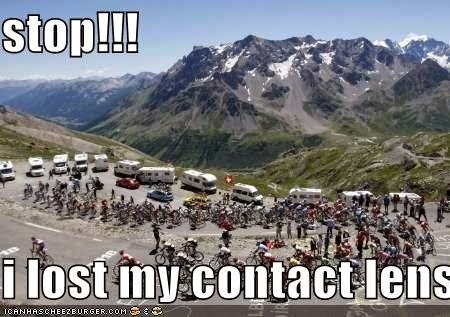 I need to have a new left contact lens made." "I guess you dropped it, huh, Perry?" "Too bad! It could be anywhere then." "Did you look in Center City Philadelphia?" "They do turn up there, just sayin'." "Well, I was nowhere near there!" "As if that makes a difference. But don't worry, sometimes when they slip into parallel dimensions, they actually return." Several days later, my new contact lens was ready. As I finished dressing on my way to go pick it up, there - right at the spot where I had dropped it the week before - was the long lost contact lens. "I'm sorry, Perry, I cannot tell you," answered Little Lens Lost, now Found. "But I do have a message for you." "Your random socks say hello." How nice of your lens to turn up in such a timely manner! Did Little Lens Lost see my random socks, too? I wonder if they all hang out together, or if they're still spinning in the universal dryer. Little Lens Lost did see your random socks but apparently they have no desire to come home. They referred to your singing around the house and use of harsh detergents. I think there is an alternate dimension where all the socks are, but overpopulation is beginning to pose a dire threat. They were all here, at my house. Your lens, all your random socks, and Pattisjarrett's random socks, too. I believe I also have the random socks of all the people in Detroit. I have a whole laundry basket full of them. I sent the lens back, though. I was just about to come over and search your house too, Melanie. I hope you didn't send the lens back Alternate Reality Express. Hilarious Perry. I think returning socks sometimes ended up at my house by mistake. I always wondered about that. It must have been due to the overcrowding in the alternate universe. At least your returned lense came back to the right place. There seems to be a lot the ordinary person isn't attuned to. Some would probably fault aliens.